Universal Monsters Minimates Series 3 is Haunting Toys “R” Us! Halloween is still two months away, but since it’s one of the greatest holidays ever invented, why not start celebrating it early? 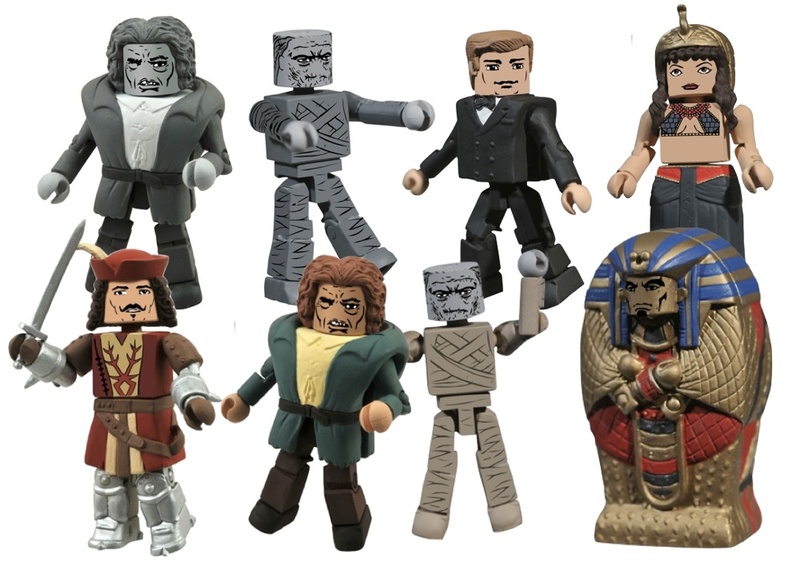 The third series of Minimates mini-figures based on the classic Universal Monsters has arrived at Toys “R” Us and toysrus.com, and it spotlights two classic films: The Mummy and The Hunchback of Notre Dame! Broken down into packs of two, the two-packs include The Mummy with an opening Sarcophagus, Princess Anck-es-en-Amon with Henry Whemple (a TRU exclusive! ), Quasimodo with Phoebus and an exclusive black-and-white set of the Mummy with Quasimodo! Check out the in-package product below! Pick these up at Toys “R” Us today, then head to your local comic shop to pre-order the two 4-packs in this series — The Mummy Box Set will include an exclusive Helen Grosvenor figure, and the Hunchback Box Set includes an exclusive Esmeralda and “King of Fools” Quasimodo! You can find your nearest comic shop at comicshoplocator.com! Currently: Each passenger can check up to 6 bags – 3 free of charge and 3 for $10 per bag. New: Each passenger can check up to 4 bags – 2 free of charge and 2 for $20 each. Currently: Each bag not to exceed 50 lbs. (23 kg), 36? x 36? x 36? (900 x 900 x 900 millimeters). New: Each bag in checked baggage is limited to a size of 75 linear inches (length + width + height). Oversize baggage (76 – 100 linear inches) is accepted for $20.00/bag. Currently: Special item rates accepted for $5, and can include tandem bikes and kayaks. New: Special items will cost $10. Tandem bicycles and kayaks are no longer accepted. Another change is luggage must be checked 45 minutes prior to scheduled train departure. The good news is passenger’s will still be able to carry on a total of 2 bags, each not to exceed 50 lbs. and 28 x 22 x 14 inches, according to Amtrak. I know many of us start budgeting early for San Diego Comic Con and things like baggage fees are a huge deal. Some of us might leave home with just 2 bags but return with twice as many! 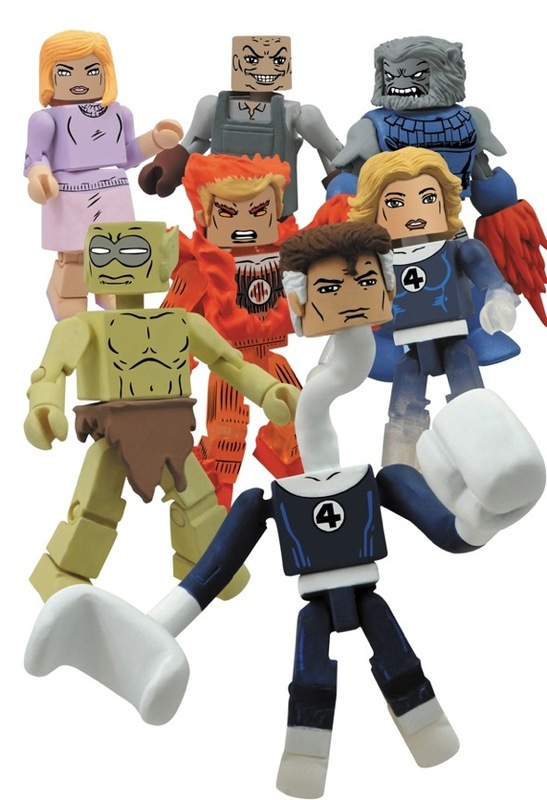 With fallen Fantastic Four member the Human Torch recently discovered alive and relatively well in the Negative Zone, Diamond Select Toys has decided to celebrate by making Marvel Minimates Series 48 their most fantastic assortment yet! Available only at comic shops and specialty stores, this series will feature three two-packs, plus one rare variant two-pack that will only be available one per case. With core FF members, old villains and a key supporting character, this will be one series of Minimates no FF fan should miss! Team leader Reed Richards comes with an classic FF foe, the conveniently named Phillip Masters. Wearing his John Byrne-designed uniform, Mr. Fantastic will sport a new stretching fist and a grabbing arm. Meanwhile, Masters will come with his distinctive apron… as well as miniscule Minimate puppets that he can manipulate, to control the actions of his foes! Johnny Storm, the hot-headed member of the Fantastic Four, has been captured in mid-combustion, and comes with a new flame-swirl display base. Once he flames on, he’ll be ready to go into battle with one of the Negative Zone’s most lethal residents: Blastaar, the Living Bomb-Burst! Blastaar has the ability to create concussive blasts from his hands, and will sport new blasting hand covers to simulate his power. The most powerful member of the Fantastic Four, according to some, Susan Richards includes opaque and partially translucent limbs to simulate her invisibility, a new clear display base to simulate her force field powers, and an alternate hairpiece to show off her ever-changing hairstyles! She’ll need everything she’s got to hold off an army of Moloids, dispatched by the Mole Man to conquer the surface world — unless these are the Moloids she makes sandwiches for as part of the Future Foundation. Buying multiple Moloids need not leave you with an arsenal of Invisible Women — the variant two-pack in this wave pairs a Moloid with Alicia Masters, the blind sculptress! She loved Ben Grimm for his inner nobility and hated her step-father the Puppet Master for manipulating the man she loved, and she even comes with a sculpture of her own — a bust of the Thing! Each Minimates stands 2 inches tall with 14 points of articulation. This assortment is only available at comic shops and specialty stores, so pre-order today! 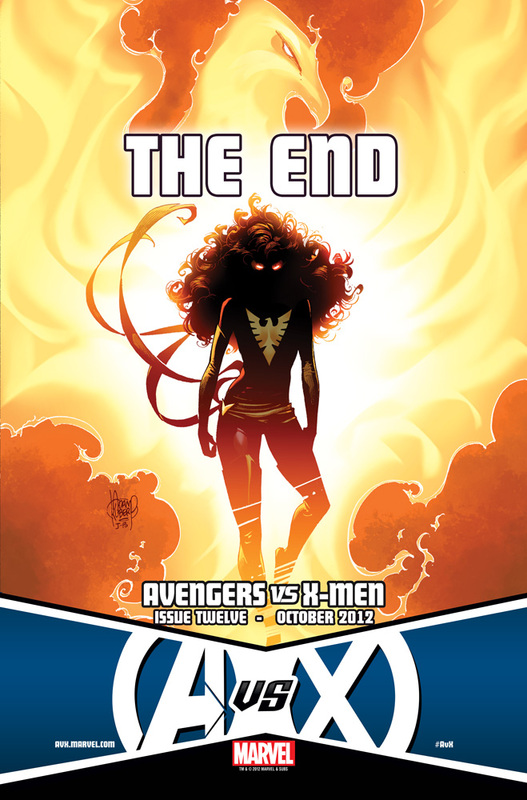 The biggest comic event of the year comes to its Universe shattering conclusion in Avengers VS. X-Men #12 this October. Here comes the pain as all your favorite super heroes enter the battle—and only one team will emerge victorious! Don’t miss out on this once in a lifetime comic event in, Avengers VS. X-Men #12, on sale October 3rd in comic shops everywhere, on the Marvel Comics app, and the all-new Marvel Comics Webstore! Francavilla’s THE BLACK BEETLE Returns! 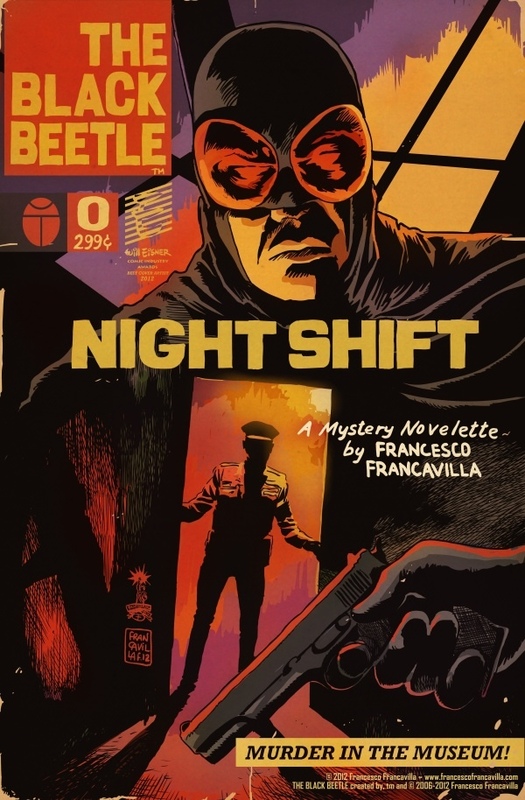 FRANCAVILLA’S THE BLACK BEETLE RETURNS TO DELIVER AWARDWORTHY PULP ACTION! August 28, MILWAUKIE, OR—Dark Horse Comics is thrilled to announce a new creator-owned series from Francesco Francavilla, the 2012 Eisner Award winner for Best Cover Artist! Francavilla’s The Black Beetle series will also showcase a letter page so fans have the chance to have their thoughts, comments, and compliments answered by the creator himself! E-mail blackbeetle[at]darkhorse[dot]com for a chance to see your letter inThe Black Beetle: No Way Out! 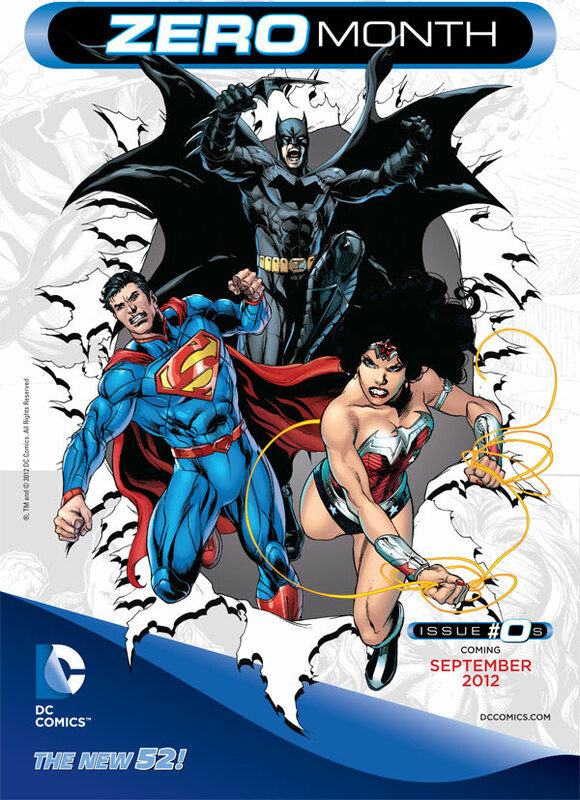 Starting next week and running through the entire month, DC Comics will be celebrating the one year anniversary of the New 52 initiative with a run of #0 issues. These issues will kick off new series, end others, and also bring back some cancelled ones with special origin stories that will build-up the future of the publishing house’s tales. Marvel – UNCANNY AVENGERS #1 GRANOV VARIANT Cover Unveiled! Marvel NOW! – UNCANNY AVENGERS #1 GRANOV VARIANT Cover Unveiled! Marvel is pleased to present your first look at the jaw dropping Uncanny Avengers #2 Granov Variant from superstar artist Adi Granov! From the ashes of Avengers VS. X-Men an all-new, all-different Avengers assemble – enter theUncanny Avengers! From the blockbuster creative team of Rick Remender & John Cassaday, Captain America and Wolverine begin a quest to create a sanctioned Avengers unit cast from the ranks of the Avengers and the X-Men. This October in Uncanny Avengers #1, watch as Captain America, Wolverine, Havok, Thor, Rogue, and the Scarlet Witch come together to take down the Red Skull and protect the Marvel Universe! Each issue of Uncanny Avengers includes a code for a free digital copy on the Marvel Comics app for iOS and Android devices and in the Marvel Digital Comics Shop. Additionally, each issue of Uncanny Avengers features special augmented reality content available exclusive through the Marvel AR app – including cover recaps, behind the scenes features and more that add value to your reading experience at no additional cost. An all-new direction! All-new threats! This is Uncanny Avengers NOW! This October, Rick Remender & John Cassaday redefine what it means to be Earth’s Mightiest in Uncanny Avengers #1!